This 5-minute movie provides you with more information on Gas Storage Bergermeer and TAQA's mission. TAQA is committed to contributing to consistent, affordable, reliable and sustainable energy supplies to Northwest Europe. Long-term analysis shows that the decline in gas production will create a substantial decrease in flexibility in the market. To fill this gap we developed Europe’s largest, open- access gas storage; providing the Northwest European gas market with 46 TWh of seasonal storage capacity. Gas Storage Bergermeer has started full commercial storage operations in 2015. Gas Storage Bergermeer is an independent storage operator with service delivered at the TTF. It offers a technically advanced, highly flexible, zero-emission storage product. We place great importance on customer focus, providing transparent and innovative services to maximise value. We strive to ensure our fair and transparent approach is evident in everything we do. From our products and services, to our Standard Storage Services Agreement – we treat all customers equally – both in terms of the auctioning of capacities and our extensive support. With Gas Storage Bergermeer, TAQA and EBN B.V. are re-using the depleted Bergermeer gas reservoir, located 2,500 metres underground, as gas storage, applying modern and innovative technology. In the last 40 years the gas was extracted to provide energy, power and heat for the Netherlands. 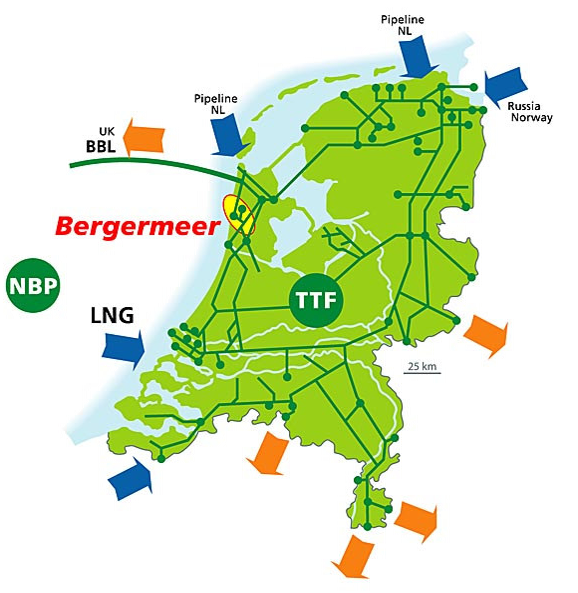 The Bergermeer reservoir has the ideal geological characteristics for gas storage and is strategically positioned: well connected to the gas transport network, close to major cities and industrial centres and only 20 km from the BBL pipeline transporting gas between the Netherlands and the United Kingdom. By developing Gas Storage Bergermeer, we created a strong base for establishing the Northwest European gas hub in the Netherlands. Sufficient natural gas storage capacity guarantees security of supply and ensures the flexibility required for a properly functioning market. The Dutch government regards Gas Storage Bergermeer as a matter of national importance. EBN B.V., participates on behalf of the Dutch State, its sole shareholder, with a 40 percent stake in Gas Storage Bergermeer.